By 1874 Manet's reputation as experimental artist and leader of the Impressionists was firmly established. The Cafe Guerbois, near Manet's studio, became the gathering spot for Monet, Renoir, Sisley, Degas and Pissaro and although Manet presided over the regular meeting and debates held at the cafe, he was not enthusiastic about his role as leader of the avant-garde. In 1874, when the Impressionists held their first exhibition at Nadar's studio, Manet refused to participate. He chose instead to remain focused on the Salon. He never exhibited in any of the eight Impressionist exhibitions and yet by no means did Manet abandon the Impressionists. He worked closely with Monet in Argenteuil during 1874 and often gave financial support to his friends who needed it. 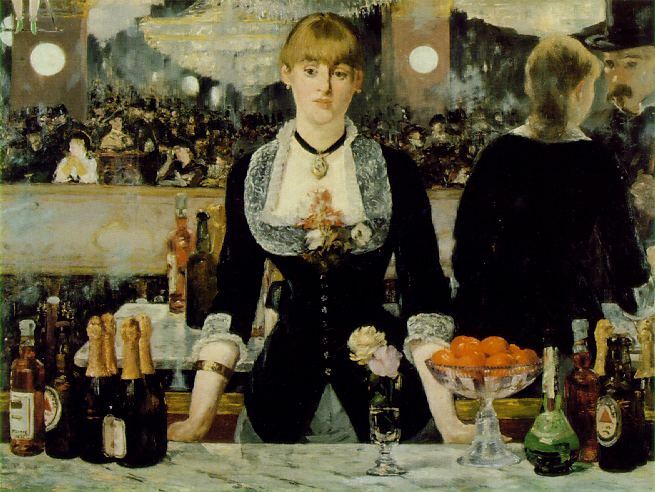 In his last great masterpiece, Bar at the Folies-Bergère (1882), Manet returns again to studio painting, a somber palette and eliminated mid tones. The cafe concert is a theme which Manet had been treating in the late 70's in paintings such as Corner in a Cafe Concert and The Cafe. But here at Bar at the Folies-Bergere, we are no longer spectators, but participants in the painting. While the Barmaid occupies the center of the piece, the painting is filled with a menagerie of characters from seated couples to trapeze artists. Glittering chandeliers and electric lights fill the upper portion of the work. Here, as in Dejeuner sur l'herbe, optical contradictions abound.